Sounds good, right? Check after the jump for additional details on the brand itself - and if interested, purchase here. 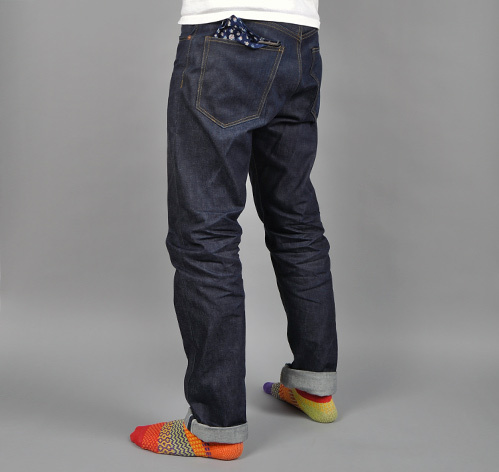 This pair of jeans is a new product made by our friend Oliver Harkness, one of New York City's vintage clothing legends. Eleven, Oliver's vintage shop at 15 Prince Street, has been one of the city's most venerable vintage purveyors since it opened in 2002. Before that Oliver had a vintage shop on Ludlow Street, which he opened in 1989 when he arrived from London. A couple years ago Oliver started making canvas bags under the name The Quality Mending Co., and recently made the new monicker permanent by changing the name of his shop from Eleven to The Quality Mending Co. These jeans are only available in two places: in person at their namesake shop at 15 Prince Street, and online at Hickoree's.